“This English language version of the Bible was created to encourage ordinary people to discover the Good News of Jesus Christ for themselves and it is likely that it was the book that first took God’s word into many people’s homes in this part of Lancashire. Sotheby’s (New York) is selling eight leaves of a Gutenberg Bible (the complete book of Esther), printed in 1455 (19 June, with an estimate of $500,000-700,000). This comes from the Jewish Theological Seminary (which is also said to be selling other Christian printed books from the fifteenth century). A ninth-century manuscript of the Gospels in Latin (The Gospels of Queen Theutberga of Lorraine) is up for sale at Christie’s in London on 15 July (from a private collection). Looks pretty nice, but the estimate of £1.5 million is a tad over my budget. The Alands have a nice chart showing the distribution of Greek New Testament manuscripts by century in their textual criticism handbook, but the data are almost 30 years old now. Thankfully, it’s possible to update their chart with data from the online Kurzgefasste Liste. Of course there are caveats. These are simply based on the Gregory-Aland categories with the problems that attend them. Second, I followed the Alands in listing a manuscript with its upper date range so that a 2nd/3rd century manuscript is listed in the 3rd here. 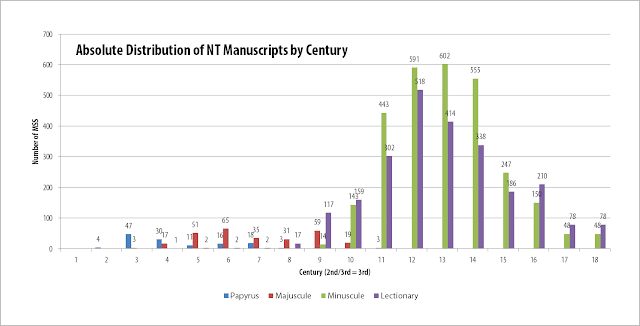 There were just over 300 manuscripts that fall into that category. Lastly, I made sure my own data was clean before I produced my charts, but I don’t make any claims that the numbers are 100% accurate. Feel free to correct these, use them in your lectures, or frame them for your children’s wall. Zondervan has recently announced the 50th anniversary of the commissioning of the New International Version (NIV) in 1965. In that year a special Committee on Bible Translation (CBT) was formed in and is still operating. Read about the CBT here. The actual translation was published 13 years later in 1978, which will give another opportunity to celebrate the real 50-anniversary in 2028. In 1965, the Committee on Bible Translation (CBT) took on the most massive translation project of modern times: to prepare a contemporary English translation of the Bible from the best available original manuscripts. Since its release in 1978, the NIV has become the world’s most read and most trusted modern-English Bible translation with over 450 million copies distributed worldwide. Upon the 1978 release of the NIV, readers were ecstatic that they could finally understand the Word of God in contemporary language. But the CBT’s work was far from complete. A smaller group of committee scholars assembled study notes, maps, charts and diagrams to provide additional content and context, resulting in the NIV Study Bible. This Bible released in 1985 and provided unprecedented clarity with over 20,000 study notes and hundreds of study tools available to readers. The NIV Study Bible was designed for anyone seeking a deeper understanding of the Bible. To date, the NIV Study Bible has sold more than 10 million copies, making it the best-selling single study Bible available over the past 30 years. For additional information on the NIV 50th Anniversary, please visit www.thenivbible.com. Regardless of what you think of this, you will find free stories, videos, app, reading plan, and other stuff on this website, that describes the history, honor the translators, and celebrates the impact of the NIV around the world. For instance, you can watch the video, “Made to Study” featuring members of the Committee on Bible Translation (CBT), Douglas Moo (chair), David Instone-Brewer (colleague of our bloggers of Tyndale House), Paul Swarup, Karen Jobes and others, which outlines the work they perform on this ongoing translation committee. 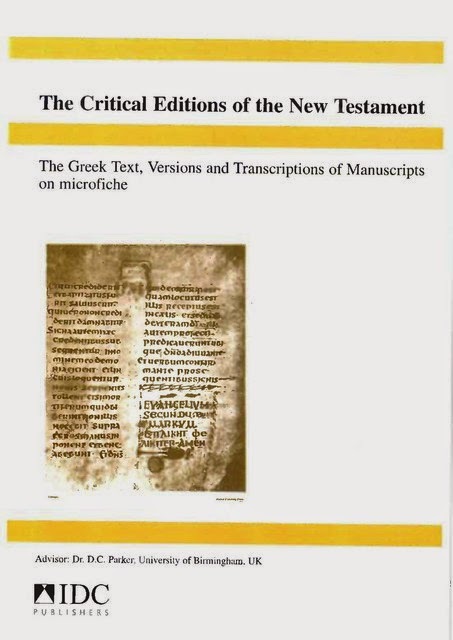 I would love to see some more resources on the textcritical work behind the translation of both the Old and New Testaments. In the meantime, you can read my old blogpost about the Greek NT text(s) underlying the New International Version (which has been reevaluated twice). I recently learned two things I didn’t know: there are five editions of the Hebrew Bible in various stages of production and there is a new Hebrew Bible journal with a number of good articles on these editions. The journal is called Hebrew Bible and Ancient Israel (HeBAI), published by Mohr Siebeck apparently as a counterpart to Early Christianity. The 2nd and 3rd volumes have issues dedicated to these new editions. I was only aware of two of these, so I was glad to have essays gathered together on all five. I’ll share the table of contents for the two volumes along with a short description of the five editions I culled from the introductory essay. I should also point out that Ron Hendel’s essay is especially good and is available free online. Biblia Hebraica Quinta (BHQ) directed by A. Schenker. The successor to Biblia Hebraica series. Now with a half dozen fascicles available. The fascicles have lots of text critical comments and I understand the hope is to publish these separately once the OT is complete. Biblia Qumranica (BQ) directed by A. Lange. This is essentially an edition of all the Biblical material from Qumran. So far there is one volume available on the Minor Prophets (Brill, 2005). Hebrew University Bible Project (HUB) directed by M. Segal. So far three volumes have been published with extensive introductions according to E. Tov. These cover Isaiah (1965), Jeremiah (1995), and Ezekiel (2004), all published by Magnes. I understand this is a diplomatic edition like BHQ. Hebrew Bible: Critical Edition (HBCE) directed by Ron Hendel. Formerly the Oxford Hebrew Bible (OHB), this edition is now to be published by SBL. Samples, introductory material, and a list of participants are online here. Randall Buth has questioned the need for such an edition on the blog in the past. Der Samaritanische Pentateuch (SP) directed by S. Schorch. An introduction to this edition from Schorch is available here. A first edition of one of the most important works of the man who inspired the Protestant Reformation has been discovered in a library in France. The publication by German theologian Martin Luther, called On the Freedom of a Christian, dates back to 1520. This was a year before he was excommunicated by the Pope for criticising the Catholic Church.It includes around 50 notes written in red by Luther himself, indicating changes he wanted for a second edition. The American who made the discovery, James Hirsten, said it gave an important insight into Luther’s thinking at the time. The annotated edition was found in The Humanist Library in Selestat, in the north-east of France. Not long ago I read the entry on New Testament textual criticism in a very good dictionary that claimed that the goal of textual criticism has shifted so that today the quest for the “original text” has been displaced by a quest for the “initial text.” The article left the impression that this was now a settled matter. When I read this it struck me as an exaggeration. True, the most widely-used edition (Nestle-Aland) has shifted its stated aim to the initial text, but have any other editions or editors shifted with it? I wondered. So I asked several editors who have edited or are editing a Greek New Testament (all reasoned eclectics for what it’s worth) and the answer back was basically no. They’ve aimed their editions at the earliest attainable text, a text which they thought was substantially identical to the original (no scare quotes). What is the goal of textual criticism? 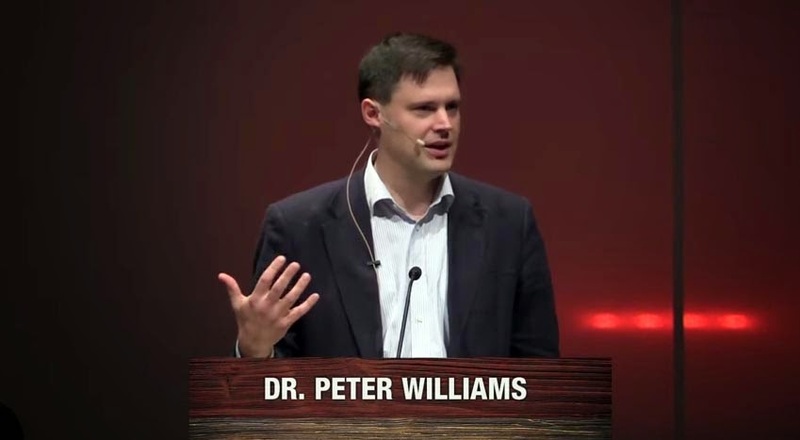 If you hang around Peter Williams long enough you will learn not to speak of the Septuagint unless you want a short lesson on the history of the translation of the Old Testament into Greek. In a recent lecture, Peter gave his reasons why he doesn’t believe in the Septuagint and why you shouldn’t either. You can watch the video on YouTube. Craig A. Evans, ‘How Long Were Late Antique Books in Use? Possible Implications for New Testament Textual Criticism’ Bulletin of Biblical Research 25 (2015), 23-37. Abstract: Recent study of libraries and book collections from late antiquity has shown that literary works were read, studied, annotated, corrected, and copied for two or more centuries before being retired or discarded. Given that there is no evidence that early Christian scribal practices differed from pagan practices, we may rightly ask whether early Christian writings, such as the autographs and first copies of the books that eventually would be recognized as canonical Scripture, also remained in use for 100 years or more. The evidence suggests that this was in fact the case. This sort of longevity could mean that at the time our extant Greek NT papyri were written in the late second and early to mid-third centuries, some of the autographs and first copies were still in circulation and in a position to influence the form of the Greek text. This is a very interesting article which raises some good questions. 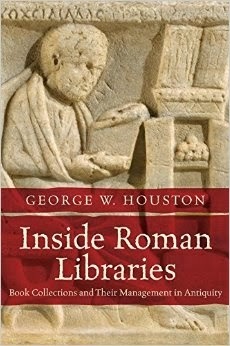 Essentially, basing himself on the work of Houston on Roman Libraries, Evans thinks that normal papyrus bookrolls in antiquity would have been in use for a long time (an average of 150 years, p. 26). This suggests to Evans that the NT autographs would probably have survived several hundred years (this he takes to be supported by Tertullian’s knowledge of autographs of Paul’s letters kept in the churches to which they were written). 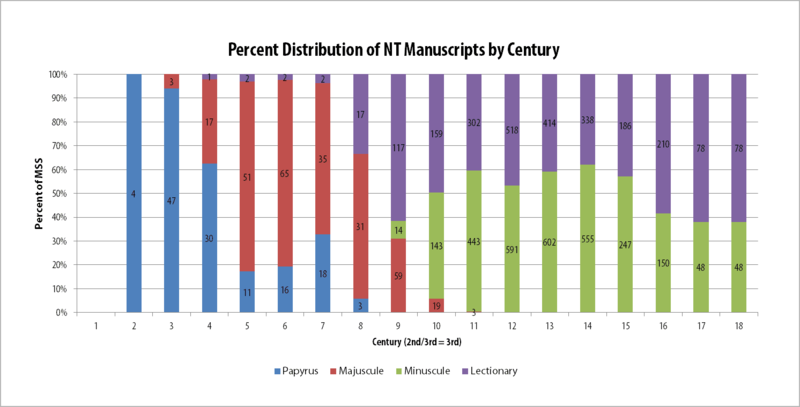 The implication for NT textual criticism is that ‘the longevity of these manuscripts [i.e. the autographs] in effect form a bridge linking the first-century autographs and first copies to the great codices, via the early papyrus copies that we possess.’ (p. 35) I’m not convinced by any of the steps in this argument, but it may be helpful to have a conversation about this in the coming days. Abstract: The last two books in what has survived of the fourth century biblical manuscript Codex Sinaiticus are the Epistle of Barnabas and the Shepherd of Hermas. This article is an investigation of the correctors’ treatment of the text of the Shepherd of Hermas in this codex, and advances our knowledge at various points of both Codex Sinaiticus and its textual revisions of the Shepherd of Hermas. Furthermore, it attempts to assess the relevance of the corrections for the reception history of the Shepherd of Hermas. This is an interesting article, taking account of the two (fragmentary) leaves of Hermas among the New Finds, and investigating the four strata of corrections to the text of Hermas in Sinaiticus (S1, ca & cc, d, corr). Well done Dan! Over on Facebook it was observed that Brill was offering a collection of historic editions of the New Testament for sale. This series, earlier published in a microfiche collection by IDC Publishers, makes available for the first time in a single online collection the principal critical editions, lists of variant readings and collections of manuscript transcriptions and collations from the late seventeenth to the early twentieth century. In addition, a number of the most useful editions of the ancient versions and of ancillary materials have been included. It begins with the first large collection, compiled by John Mill and published in 1707, and ends with von Soden’s huge work of 1902-13. Beza: for links to the different editions (and other works of Beza) go here (Jan Krans). Richard Bentley (1720), Proposals for Printing and his specimen of Rev 22 are at Google Books. Matthaei (1782-1788) vol. 11: Matthew (1788); vol. 12: Mark (1788); vol 10: John (1786); vol. 1: Acts (1782); vol 5: Catholic Epistles (1782); vol. 3: 1&2 Corinthians (1783); vol. 6: Gal, Eph & Phil (1784); vol. 4: Hebrews & Col (1784); vol. 7: 1&2 Thess and Timothy); vol.8: Apocalypse (1785). 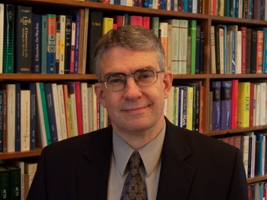 David Jenkins (Librarian for Classics, Hellenic Studies and Linguistics at Princeton University.) has an excellent database of digital images of Greek manuscripts: Digitized Greek Manuscripts. Currrently this lists 3360 Greek manuscripts which can be searched by date (century) and subject etc. An excellent resource, although could probably do with some more options in terms of Biblical manuscripts (currently though you can search for “Bible”, “Old Testament”, “Gospel Lectionary”, “Synaxarion” etc.). I am pleased to announce that The Pericope of the Adulteress in Modern Research has been accepted for publication in T & T Clark’s Library of New Testament Studies series. You may recall that SEBTS hosted a major conference on this topic in April of 2014. Chapter 6: Larry Hurtado: “The Pericope Adulterae: Where from Here? I’ll just say that I’m delighted that Gail O’Day agreed to write the foreword and Larry Hurtado the response. And, of course, I am grateful beyond words to T & T Clark. If this book in an way contributes to even one person coming to a better understanding of this key New Testament passage, then the conference was worth the effort a billion times over. Quiz question: on the basis of the presented evidence, what do you think Codex Ephraemi rescriptus reads? When we look only at the first words it seems that C reads (2), οστις δε. But it also becomes clear that the variant unit as given in the pocket editions of NA27/28 cannot capture the full situation. The following verb has something to do with the variant οστις δ' αν. In some early Greek bookhands the Π and Ν are rather similar as the connecting line of the Ν between the two verticals can be quite horizontal. The presence or absence of αν is not unrelated to the presence / absence of απ- in the verb απαρνησηται. One way in which these variants can be related to one another is to assume (2) is the origin, morphing into (3) under influence of the regularly occurring απαρνεομαι, whilst (1) is a scribal corruption of (3). The final reading is then a conflation between two secondary readings, namely (1) and (3). Of course other orders are feasible as well, for example those that start with taking the text (1) as the source of all the others. It is just that the patterns of corruption are less obvious in those orders. Anyway, if we accept the boundaries of the variant as given in the pocket editions, C ought to be cited in support of the variant reading οστις δε. A line of support that looks like B C L 1424 has quite a bit of weight. The failure to mention C, however, is understandable in light of what follows. Shame that it requires so much work to understand C's omission from the apparatus. Roger Omanson has passed away on April 30 after a short battle with pancreatic cancer at the age of 68. Omanson devoted most of his career to bible translation with the United Bible Societies, and authored numerous articles and books including A Textual Guide to the Greek New Testament: An Adaptation of Bruce M. Metzger's Textual Commentary for the Needs of Translators (Hendrickson Publishers, 2006; see here). Obituaries in The Courier-Journal Obituaries and Baptist News Global. The interview poses the question of the nature of the theological tensions between Trobisch and Steve Green as, in Trobisch’s words “two parties standing at opposite ends of the Christian spectrum talking to each other and working together”.